For centuries, an unsigned portrait of a beautiful young woman at Rome's Galleria Borghese remained shrouded in mystery. Now a focus exhibition at San Francisco's Legion of Honor, Sublime Beauty: Raphael's "Portrait of a Lady with a Unicorn" brings the enigmatic teenager to the U.S. for the first time with a new theory about her identity (January 9 to April 10). "Inexplicably magnetic, it stops you in its tracks," says Esther Bell, the show's organizer and curator of European Painting at the Fine Arts Museums of San Francisco. "It's a beautifully balanced painting and one of Raphael's most beautiful portraits." 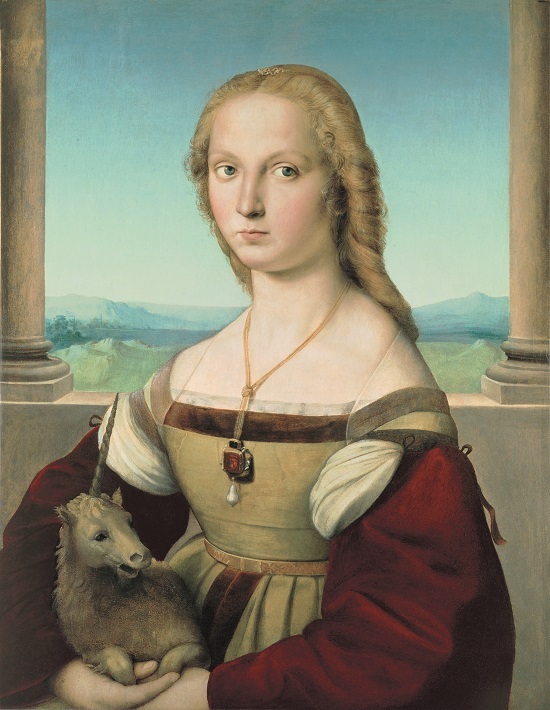 First recorded in the Borghese collection in 1682, "Portrait of a Lady with a Unicorn" was misattributed to a number of artists, including Pietro Perugino and Domenico Ghirlandaio. Further clouding matters, in the mid-17th century, an unknown artist changed the sitter into St. Catherine, covering her bare shoulders with a cloak and replacing the small unicorn in her lap with a wheel. During conservation work in 1934 when the painting was transferred from wood panel to canvas, the 17th century repainting was removed, revealing the unicorn. In the process, art historian Roberto Longhi's attribution to Raphael was confirmed. Twenty-five years later, another restoration revealed a small lap dog, a symbol of fidelity, painted underneath the unicorn. Today, most scholars agree that Raphael, one of the greats of the Italian High Renaissance, was commissioned to paint the young woman in celebration of her upcoming wedding. It's thought that when the betrothal was called off for a better offer, Raphael may have replaced the small lap dog with the unicorn, a symbol of chastity or virginity. Writing in the exhibition catalogue, Galleria Borghese director Anna Coliva sticks to the long-standing view that the fair-haired sitter is Maddalena Strozzi -- based on similarity in pose and composition to a Raphael portrait from Florence's Pitti Palace. Through a detailed exploration of the sitter, unicorn, and setting, Dr. Linda Wolk-Simon, Raphael specialist and director and chief curator of the Bellarmine Museum of Art at Fairfield University, suggests a new identity for the young woman. In a catalogue essay that reads like a detective story, Wolk-Simon makes a persuasive case that the sitter is Laura Orsini, daughter of acclaimed beauty Guilia Farnese, mistress of Rodrigo Borgia, Pope Alexander VI (the rumor at the time was that Laura's father was Alexander, not Farnese's husband). In late 1505, right around the time Raphael painted the portrait, 13-year-old Laura Orsini wed Niccolo Franciotti della Rovere, nephew of Alexander's successor, Julius II. "I started looking at every detail in the picture for clues and certain things started jumping out," says Wolk-Simon. To start, the sitter is blonde -- like Lucrezia Borgia, Alexander VI's illegitimate daughter and Laura Orsini's probable half-sister. A tower in the portrait's background is from a landmark in Urbino, the duchy ruled by the della Rovere family. Wolk-Simon also discovered that the sitter's stunning ruby and pearl pendant necklace closely resembles a description of Guilia Farnese's jewels from court documents; the mythical unicorn cradled in the young woman's right hand turns out to be part of the Farnese coat of arms. When 21-year-old Raphael arrived in Florence in late 1504, he was already acknowledged as a master, eclipsing his teacher Perugino, according to Esther Bell. Yet, the precocious talent set out to learn from Leonardo da Vinci and Michelangelo, both working in Florence at the time. Raphael's "Portrait of a Lady with a Unicorn" is clearly indebted to Leonardo's masterpiece, "Mona Lisa." The exhibition explores the relationship between the two portraits, with Raphael adopting Leonardo's innovative half-length format, the sitter's folded hands, and beautiful landscape. "Florence is a small place and Raphael may have either seen the "Mona Lisa" itself or Leonardo may have befriended him and showed him his drawings," adds Wolk-Simon. "Raphael's drawings underwent a radical transformation when he gets to Florence. He loosens up, and masters pen and ink and red chalk." In 1508, Raphael left for Rome, where he created a series of masterpieces at the Vatican for Julius II. After 12 years, the charming 37-year-old superstar died. According to Giorgio Vasari, "amatory excess" was to blame. Though the jury's still out on the identity of Raphael's early subject, Legion of Honor visitors are in for a rare treat. "The exhibition is an unusual opportunity to stop and spend time with a single, powerful image," adds Bell. Susan Jaques' upcoming book, "The Empress of Art: Catherine the Great and the Transformation of Russia" will be published in April by Pegasus Books.